Lawrence Kasdan reveals why he's returning to Star Wars. Plus the latest X-Men hints from Bryan Singer! Another rising star joins Ryan Gosling's crazy modern fairy tale How to Catch a Monster, while Steven Moffat assures us that Matt Smith's movie role doesn't mean his Doctor Who departure. Check out new photos from All You Need Is Kill! All that plus there's more casting news for the Wachowskis' Jupiter Ascending, Neil Gaiman teases his Cybermen Doctor Who episode, Vin Diesel unveils another Riddick photo, and you will never guess who Warner Bros. may have asked to play Batman in their (for now) scrapped Justice League movie! I was pleased that there would be new ones, that there was a chance to capture some of the spirit of the original trilogy that I'd worked on. I thought there's an audience out there — my grandchildren, lots of original Star Wars people — and there always will be. It's only good that we try to do some more great ones. How long ago did you know that you were going to be working on this? Was this kind of a sudden development? No, this started last fall. It actually first started with conversation I had with (Kathleen Kennedy) and George [Lucas]. What can you tell fans about this new version that you're working on? There are so many rumors going around. They're going to be fun. J.J. (Abrams)'s a great director for the first sequel. Perfect. We're very happy to have him. The writers I've been working with — Michael Arndt, who's going to write the sequel, and Simon Kinberg, who has, like me, been sort of consulting — they're great. I've never really collaborated a lot, and I've never been a room with a bunch of writers thinking, "Well, what should this thing be?" It's fun. It's really fun. And J.J.'s a writer. Yeah, lovely guy. I'd met him but didn't know him. But now I'm totally enamored by him. He's really funny and so enthusiastic. "I'm trying to start fresh. There are certain pleasures that we think the saga can bring to people that they've been missing, and we're hoping to bring them that, and at the same time, have them feel that it's all new. George sort of brought me into this part of it. and he's stepping back from the company. He's sort of given his blessing to everybody, and he'll be there if you need him. I think everyone's interested to see where this can go. It's been some very different places over 30 years …. I think with J.J., we'll get something entirely new." "He's in my heart. I know Yoda very deeply. I think it depends on the story, but I think at this point you can't go back to the puppet. The reason George [Lucas] did the CGI, which I supported, was that he wanted to tell a story that would have been hampered by the physical limitations of the puppet." Yeah, we performance-captured the giants first on a volume stage. The challenge that we had, that "Avatar" did not, was that you've got real actors interacting with giants. This was my first 3-D movie as well, and I took a lot of care with the stereo. But to do a fully animated kind of thing? I definitely want to use this technology again, and I might even be using some of it in a different way in "X-Men." I don't wanna say how, yet, but I'm definitely using some of this technology on "X-Men" which I never used in any of the other "X-Men" films. Are you talking about creating a fully CGI character in "Days of Future Past"? That's the thing I don't want to talk about. I'm not sure. I'm doing research on it now. He's not an easy character! I got very nostalgic with my movie but even if you take it in another direction it's very challenging… inherently he's such a good guy… what's easier about X-Men is that they're all so conflicted. What's going to be interesting in the next X-Men movie is that the characters are incredibly polarized. Here are some new set photos from Tom Cruise and Emily Blunt's time-looped soldier movie, courtesy of WENN.com. And here's a character poster. "I've written [one] that broadcasts in May. It guest stars Warwick Davis, Tamzin Outhwaite and Jason Watkins. 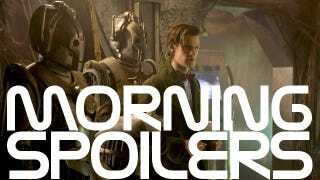 The episode is called The Last Cyberman. It's about identity, it's about responsibility and it's about porridge." That's part of what we do in the back half of the season. Now we get to spend time with some other characters. Glenn (Steven Yeun) comes to the forefront, but has a personal agenda. He wants revenge because Maggie (Lauren Cohan) was assaulted by The Governor. Maggie has her own thoughts about the nature of that assault. Hershel (Scott Wilson) has certainly stepped into the foreground too because he realizes Rick's a good man, has been a great leader, but now is perhaps not up to the task of defending the group. Everyone right now has an agenda. And even Carl (Chandler Riggs) has a plan. Carol (Melissa McBride) has thoughts. This is not the group that was at the end of Season 2 that was huddled by the fire, pleading with Rick to save them. These people are battle-tested and any one of them could take a shot at The Governor. What will Rick do to actively try to gain some of his sanity back? There's an episode that's coming up that deals with Rick trying to hold on to his sanity, and I really think it's going to be a fan favorite for the entire series. It's a very special episode. It's very different, and it's the curveball. Sometimes fans like curveballs, sometimes they don't, but it's a pretty exciting episode, so that question gets dealt with head on. Here are the first four minutes of tonight's episode, "Get Outta My Dreams, Get Into My Mouth." Bo faces the daunting task of returning to where it all started: down home on the farm. There Bo faces her old demons - and a new one - to clear the way for the path she will soon be forced to travel.